Issy turned 1O in January (How the fudge did that happen? I'm a mother to a TEN year old!!) and for the past year has said she would like a 'selfie party' this girl does loves a selfie! What's better than a photo booth for a bit of photo fun? What with making birthday celebrations a little more purse friendly her 'Selfie party' consisted of a chosen friend from school, pizza and a good old fashioned sleepover along with a trip to Gravity for the day, My house isn't quite big enough to actually hire a photo booth. So while she was at school me and Andy put together a little home made photo booth complete with inflatable props and silly glasses. In total the 'booth' cost us a grand total of £22.18. 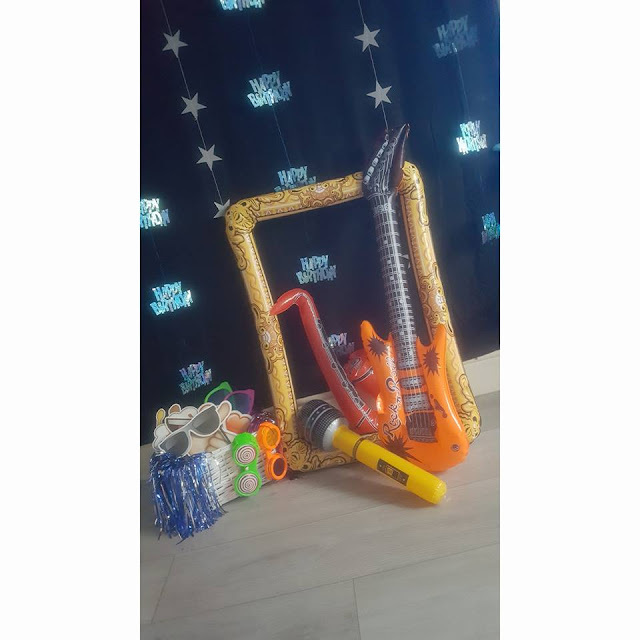 I purchased the inflatables, stars and Happy Birthday dangleys from eBay, the black back drop is just a black fitted sheet from Asda and the basket of glasses,pom poms and selfie emoji props on sticks are all from Poundland. You could easily create your own photo booth with a chosen theme eBay, Amazon,Party Pieces and those party shops randomly placed in some high streets are great for accessories for this kind of thing, I was hoping to get some wigs in too along with the other props but struggled to find some purse friendly ones considering they were very likely to end in the bin after months of moving them from place to place anyway but I know they're out there, I've seen them so they'll be something I'll be grabbing as I see them through out the year for any future photo booths we do.